News Today, Israel Pulled A Hillel! Today, Israel Pulled A Hillel! Hillel lived two thousand years ago and yet, his words and his stance on many legal issues in Judaism remain. He and Shammai, another scholar, often debated issues. For the most part, Shammai was the legalist, Hillel the humanist. But not completely and probably not according to today’s standards. One of Hillel’s most famous statements is: “If I am not for myself, who is for me? And being only for myself, what am I? And if not now, when?” In a sense, as many are quick to tell you, this sums of Israel, Torah, and Judaism all in one. 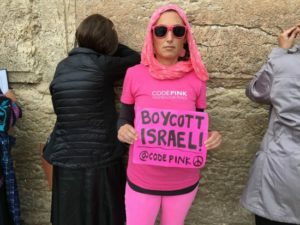 Ariel Gold believes in boycotting Israel. After a post exposing her anti-Israel stance on IsraellyCool, she deleted the offensive posts that clearly showed her political leanings. Coward that she is. Now, while calling for a boycott of Israel, she’s annoyed – that Israel boycotted her back. Add hypocrite and immature to the list of her personality traits. Yesterday, Israel pulled a Hillel and I am infinitely proud that we had the courage to do it. She flew to Israel knowing exactly what was going to happen and still, I have the feeling that she was surprised that we had the nerve to do it. She was stopped at passport patrol, turned around and deported. This is straight from Hillel – a voice from 2,000 years ago warning Israel that we must take care of ourselves, even as we take care of others. 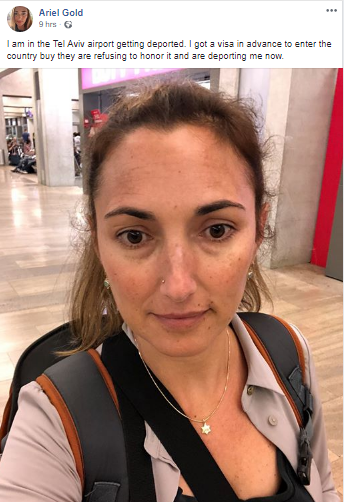 Having flown all this way to enter my beautiful and moral country while it is under attack and over 7,000 acres of land have been destroyed by her pals, I wanted to share a parting message with Ariel Gold – as an Israeli, as a Jew. As a mother and a wife and a woman. And here it is…. I’m so proud of Israel for refusing you (Ariel Gold) and your hatred from entering our beautiful land. And the fact that this pisses you off…icing on the cake. Hillel – today, I hope we made you proud. Hillel and the rest of the Jewish, Israel -loving world is so very proud of you! Am Yisrael Chai …and bds ( I will not capitalize those letters) be damned! Why did they even allow her to go aboard and reach Israel? They should have stopped her at the airport of origin or upon getting her ticket! If you boycott Israel, then really boycott it. Don’t go there you attention seeking idiot! You treachery to the Jewish people has been confirmed you kapo cvnt! May all of us Jews and others, which reject this BDS gang, join you to defend our ETERNEL land ISRAEL!!!!!!!! I simply adore everything about this article. It is very comforting that we have the last word at times and unfortunately, it doesn’t happen often enough. Yet when it does, it’s simply divine. Doubtful that she’ll even read your article, yet on the small chance that she does, hmm…nice.